First published in The Guardian, 3 September 2014. Now this is the way to start an art movement. In February 1909 the Italian poet Filippo Tommaso Marinetti published an eleven point plan in an Italian newspaper, which called for aggression, conflict and struggle, the praise of youth, speed and technology. This was the first Futurist Manifesto. Incredibly, two weeks later, it was published in one of the most important newspapers in the world, the Parisian journal Le Figaro – ON THE FRONT PAGE! How? I’m not sure. The writing is quite intoxicating, reminiscent of the poetry of Rimbaud. It has been described, quite accurately, as “beautiful, poetic, intense and insane” It was also a complete bluff. It says “we” throughout but there was no group. Futurism existed solely in Marinetti’s head. After this coup several young, like-minded artists were drawn to his cause and the movement soon became a reality. To get some sense of Marinetti perhaps the closest modern figure was Malcolm McLaren, except that Marinetti was more radical and more influential. He was a brilliant publicist. In those early days of mass media he was very media savvy, which was highly unusual. Among other things he realised that getting arrested was an excellent way to guarantee publicity. At one point a bunch of Futurists stood on the roof of St Mark’s Basilica in Venice, hurled abuse at the people coming out from mass, while announcing, with trumpets, Futurist principles. One of many Futurist stunts. For more information on the very interesting birth of this movement, there is a very good article here. 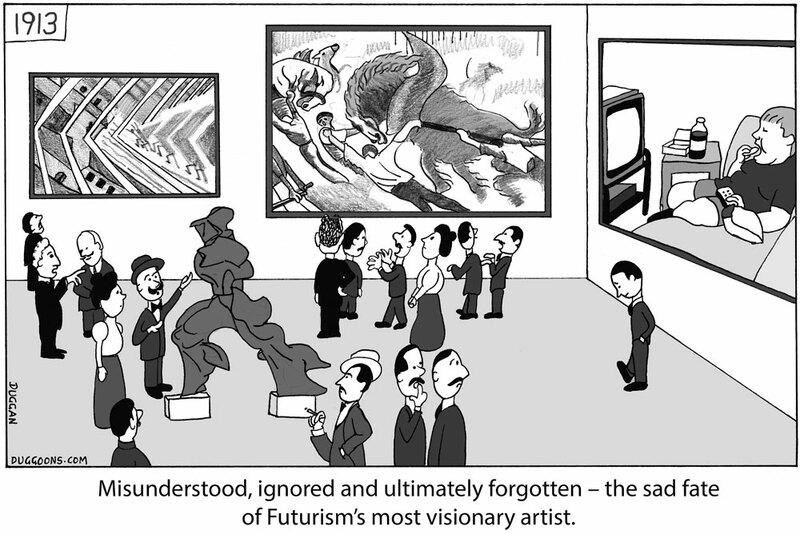 I once had an encounter with a Futurist. For a number of years I worked at the Art Gallery of New South Wales in Sydney as a Registrar, which mainly involved looking after all the artworks in storage. I needed an assistant and interviewed this person for the position. I still have the transcript. We are on the extreme promontory of the centuries! What is the use of looking behind at the moment when we must open the mysterious shutters of the impossible? Time and Space died yesterday. We are already living in the absolute, because we have already created eternal, omnipresent speed. Oh, um…I meant me. Sorry. Don’t worry. It’s ok to be nervous. Just take your time. Now…How would you deal with confrontation in the workplace? We want to glorify war — the world’s only hygiene — militarism, patriotism, the destructive gesture of the anarchists, beautiful ideas worth dying for, and contempt for woman. I see……Describe a situation in which you used initiative. I spun my car around with the frenzy of a dog trying to bite its tail, and there, suddenly, were two cyclists coming towards me, shaking their fists, wobbling like two equally convincing but nevertheless contradictory arguments. Their stupid swaying got in my way. What a bore! Pffah! I stopped short, and in disgust hurled myself — vlan! — head over heels in a ditch. Oh, maternal ditch, half full of muddy water! A factory gutter! I savoured a mouthful of strengthening muck which recalled the black teat of my Sudanese nurse!…When I came up—torn, filthy, and stinking—from under the capsized car, I felt the white-hot iron of joy deliciously pass through my heart! What do you expect to be doing in 5 years time? The oldest among us are not yet thirty: we have therefore at least ten years to accomplish our task. When we are forty let younger and stronger men throw us in the wastebasket like useless manuscripts—we want it to happen! They will come against us, our successors, will come from far away, from every quarter, dancing to the winged cadence of their first songs, flexing the hooked claws of predators, sniffing doglike at the academy doors the strong odour of our decaying minds, which will have already been promised to the literary catacombs. But we won’t be there… At last they’ll find us—one winter’s night—in open country, beneath a sad roof drummed by a monotonous rain. They’ll see us crouched beside our trembling aeroplanes in the act of warming our hands at the poor little blaze that our books of today will give out when they take fire from the flight of our images. They’ll storm around us, panting with scorn and anguish, and all of them, exasperated by our proud daring, will hurtle to kill us, driven by a hatred the more implacable the more their hearts will be drunk with love and admiration for us. Right. And lastly…Why do you want to work in an Art Gallery? Museums, cemeteries! Truly identical in their sinister juxtaposition of bodies unknown to one another. Museums are public dormitories where you sleep side by side for ever with beings you hate or do not know. Museums: absurd abattoirs of painters and sculptors ferociously slaughtering each other with color-blows and line-blows, the length of the fought-over walls! That one should make an annual pilgrimage, just as one goes to the graveyard on All Souls’ Day—that I grant. We can even imagine placing flowers once a year at the feet of the Mona Lisa! But to take our sorrows, our fragile courage and our morbid restlessness to the museum every day, that we cannot admit! Do you want to poison yourselves? Do you want to rot? It hardly needs to be said – I hired him on the spot. He seemed to be energetic and forward-thinking – exactly the qualities the Gallery needed as we entered the 21st century. I have since moved on but I hear he still works there. I think he may even be the Director now.